👫👬 of the 🌎, appreciate what you're given, go out there and enjoy your 🍟. was a political euphemism for French fries in the United States. The term was born in 2003 when the then Republican Chairman of the Committee on House Administration, Bob Ney, renamed the menu item in three Congressional cafeterias in response to France's opposition to the proposed invasion of Iraq. In the character picker, any prefix substring match on a word relating to that emoji will present the emoji for selection. Therefore ‘free’ or ‘freedom’ will match ‘freedom fries’. Where does the OS find these strings? $ plutil -convert json -o - /System/L*/Priv*/CoreE*/V*/A/R*/en. */C* | jq -r ". 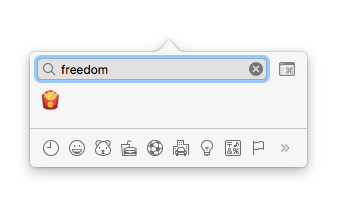 [\"🍟\"]"
I don't want QuickType to suggest 🍟 as an autocomplete to ‘freedom’! It won't. QuickType autocomplete emoji suggestions, or Messages tap-to-replace words with emojis when the emoji keyboard is shown, is defined by another file, FindReplace.strings. Emojis are suggested as word replacements when an entire word in the original text matches an entire word in a string relating to the emoji. The word ‘freedom’ will not be replaced by the emoji since the ‘freedom fries’ phrase only exists in CharacterPicker.strings, not FindReplace.strings. $ plutil -convert json -o - /System/L*/Priv*/CoreE*/V*/A/R*/en. */F* | jq -r ". [\"🍟\"]"
As of MacOS 10.14.4 (released Mar 25, 2019), "freedom fries" is no longer a search keyword for the 🍟 french fries emoji. I checked before and after upgrading from MacOS 10.14.1 (released Oct 30, 2018) to confirm that this was a recent change. The removal was plausibly a result of this Stack Exchange thread (posted Nov 2, 2018). I can't find anybody else on the internet drawing attention to this keyword until this question was posted. This question got over nine thousand views and was a Stack Exchange "Hot Network Question", and then I emailed Tim Cook for good measure. Please consider removing this keyword. Jeremy is a new contributor to this site. Take care in asking for clarification, commenting, and answering. Check out our Code of Conduct. Not the answer you're looking for? Browse other questions tagged macos text-input emoji . Why does my iPhone Spotlight (Springboard) search show a little poop emoji in the corner? Why does my super sad face emoji change when I send it?